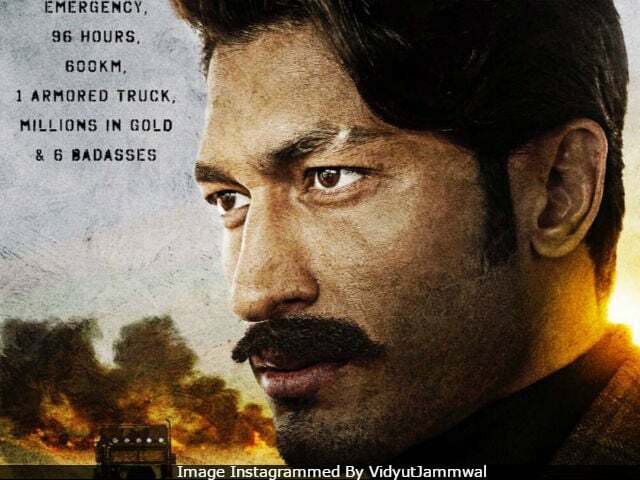 Vidyut's character is introduced as "the badass with a badge"
Over the last three days, the makers of Baadshaho have kept fans hooked with the first look of the actors from the film. After introducing 'badass brothers' - Ajay Devgn and Emraan Hashmi, the makers of Baadshaho unveiled the first look of Vidyut Jammwal's from the film today. Vidyut is introduced as, 'the badass with a badge.' In the poster, the actor features in a retro look with a moustache, glaring eyes and has an angry expression on his face. Baadshaho, directed by Milan Luthria, is based on the Emergency era. Actresses Ileana D'Cruz, Esha Gupta and Lisa Haydon are also part of the action-thriller. Check out Vidyut Jammwal's first look from Baadshaho. Here are the posters featuring Ajay Devgn and Emraan Hashmi. Of the film, Mr Luthria earlier told news agency PTI, "This is a historical fiction film. We have used some facts, there is lot of stuff that was unusual and exciting. Emergency as subject is a great backdrop for action and thrills. We have done extensive research on the subject." Here's the first poster of Baadshaho. Vidyut Jammwal, 36, debuted in Bollywood with the 2011 film Force, in which, he starred in a negative role. 2013's Commando was Vidyut's first film as a lead actor. The sequel to the film released earlier this year. Baadshaho will be Vidyut's second release of 2017. Meanwhile, Baadshaho is Milan Luthria's second film with Ajay Devgn and Emraan Hashmi. They previously worked together in Once Upon A Time In Mumbai. Baadshaho releases on September 1.